At the 596th communication, Bro. Melvin Chadow was presented with his 50 year apron and certificate by the RW Albert G. Cortizo, DDGM of the 2nd Nassau District on behalf of the MW Edward G. Gilbert, Grand Master of Masons in the State of New York. Congratulations to Bro. Mel for 50 years of Masonic service. As our quest for lodge history continues, Bro. 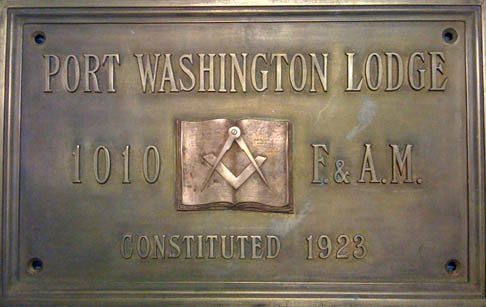 James Brew found the original lodge building plaque for the original Port Washington Lodge.